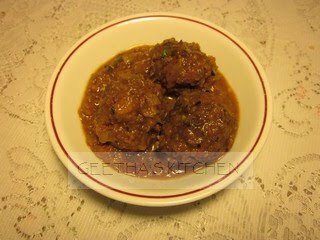 Cabbage Kofte are quite easy to make and it never ceases to amaze me how much everyone loves them! Although I used cabbage here, you can use pretty much any vegetable(s) you like such as zucchini, opo (lauki), or other summer squashes, to make these. 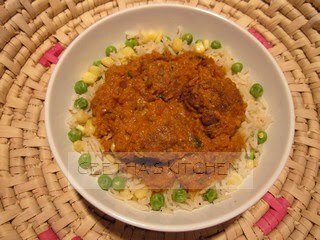 For ease of preparation, prepare the kofte as well as tomato sauce a day or two ahead and reheat before serving. Cabbage Kofte are vegan and gluten-free (FYI: kofte - plural; kofta - singular). Besan (garbanzo bean flour) is the wonder flour to have on hand to make this dish. It contributes taste as well as nutrition to this dish and is indispensable for making many other dishes such as bajjis/pakodas, kadi, pancakes, veggie cutlets, and sweets. Besan (gram/garbanzo flour) and the spices/herbs including Kasoori Methi are available in Indian Markets. Kasoori Methi is a very fragrant herb (dried fenugreek leaves) but it may be omitted if not available. The kofte and the sauce can also be frozen; I like to freeze them separately. When you are ready to serve, let the kofte defrost while the sauce is heating and proceed as directed in the "assembly". If I am preparing to serve the same day, I start with the grating of the veggies. After salting the veggies, I start the sauce. While the sauce is simmering, I proceed to make the kofte. Grate the cabbage and carrots into a large bowl, sprinkle with 1/2 tsp salt and set aside for at least 15 to 20 minutes. Squeeze out the excess fluids from the vegetables (save the juices for the sauce); don't be afraid to squeeze firmly. Mix the vegetables with 1/2 tsp salt, spices, rice flour, and enough of the gram flour to form a soft dough. Heat oil in a suitable pan to deep fry. Form the veggie mixture into small balls about the size of a walnut (about 1" in diameter) and carefully slip into the hot oil. Put in only a few balls into the oil at a time (depending on the size of the frying pan) to avoid crowding. Gently turn the kofte to brown evenly on all sides. Remove the kofte with a slotted spoon when they are golden brown and drain on absorbent paper towels. Puree the green chili, ginger, poppy seeds and almonds with a couple of the cored tomatoes and blend until smooth; add the rest of the tomatoes and process into a fine puree. Heat the oil in a Dutch Oven (4 or 5 quart pot) and lightly brown the cumin seeds. Add the onions and cook until soft. Turn heat down and add the rest of the spices. Stir well and cook for a couple of minutes. Add the tomato puree and the juice saved from the grated veggies. Mix well and add about 1 cup of water to thin the sauce, bring to a boil, and simmer covered for 20 minutes stirring occasionally. If the sauce is too chunky in appearance, it can be pureed; an immersion blender is great for this job. If you are making the sauce ahead of time, cool and store until ready to use. Do not be concerned if the sauce is thin; it will thicken when you add the kofte - the kofte absorb a lot of the moisture. Gently put the kofta into the simmering sauce and turn them to coat. Turn off heat and sprinkle the crumbled kasoori methi on top. Let the kofte marinate for at least 30 minutes, preferably 1 hour. Check to make sure that the koftas are soft and have absorbed some of the sauce. If you are using frozen kofte/sauce, it might take a little longer to heat up. Sprinkle the cilantro on top and serve hot with your favorite rice dishes or Indian breads with any kind of raita and/or plain yogurt.